Robin Miller, aka “roblimo,” asked me a few questions about the state of the newspaper business and the future of journalism. And speaking of the future of journalism, here I argued that the ability of a local-news site called ARLNow.com to hire its first full-time reporter is probably a better sign of the health of my profession than Nate Silver’s headline-making move from the New York Times to ESPN. 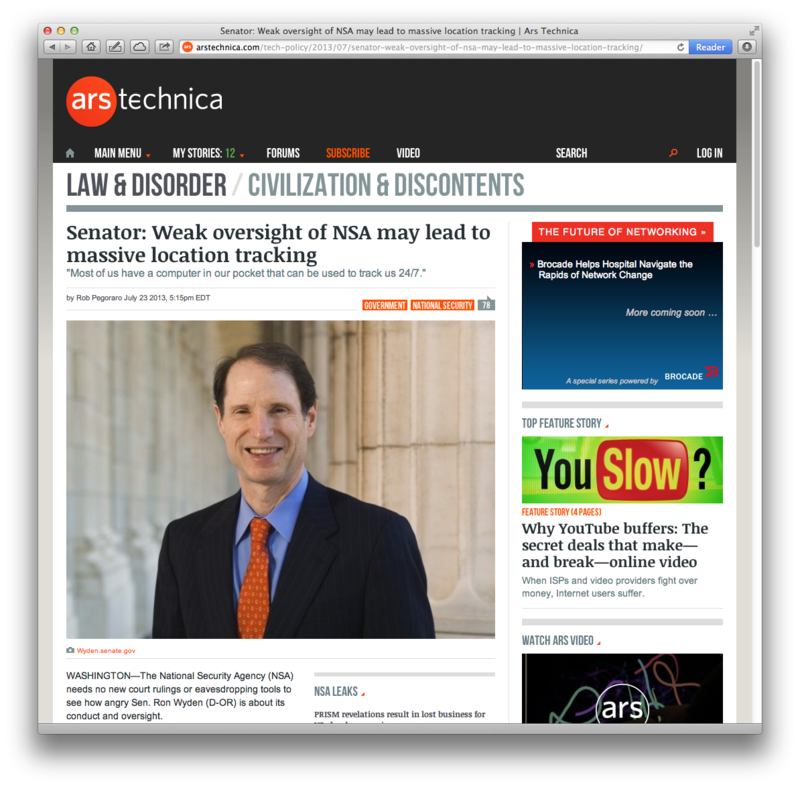 I wrote up the speech Sen. Ron Wyden (D-Ore.) gave at the Center for American Progress about government surveillance and the secret body of law that barely constrains it. The number in the title of this week’s episode refers to the U.S.’s ranking in a recent survey of broadband access; tune in to see host Denise Howell, Public Knowledge president Gigi Sohn and me talk about the state of our broadband market and a grab-bag of other issues. The last time I spoke at a monthly meeting of the D.C. area’s Apple user group was in February 2011. A few things have changed since then (my ability to get lost on the roads of George Mason University’s Fairfax campus is not among them), so I enjoyed catching up with my friends at WAP. A reader wanted to know a cheap way to get a laptop online during a long cross-country trip, so I suggested some prepaid data services–most reselling Sprint’s old WiMax network. I also shared a tip about using mobile sites when you’re starved for bandwidth, one of the things I’ve resorted to in the face of uncooperative WiFi at conferences and elsewhere. Sulia highlights: Excoriating the worse-than-Apple performance of Nokia’s Windows Phone mapping app, noting the impending arrival of a $999, 50-inch 4K TV, celebrating a pathetically overdue tech-patent ruling and wondering if faster WiFi on Amtrak will induce demand that leads to the same slow wireless as before. This entry was posted in Weekly output and tagged ARLNow.com, Brian Krebs, Clear, Denise Howell, FISA, FreedomPop, Gigi Sohn, GMU, Internet To Go, Karma Mobility, mobile sites, Nate Silver, NSA, prepaid data, PRISM, Robin Miller, roblimo, Ron Wyden, Slashdot, Snowden, This Week in Law, WAP, WiMax by robpegoraro. Bookmark the permalink.